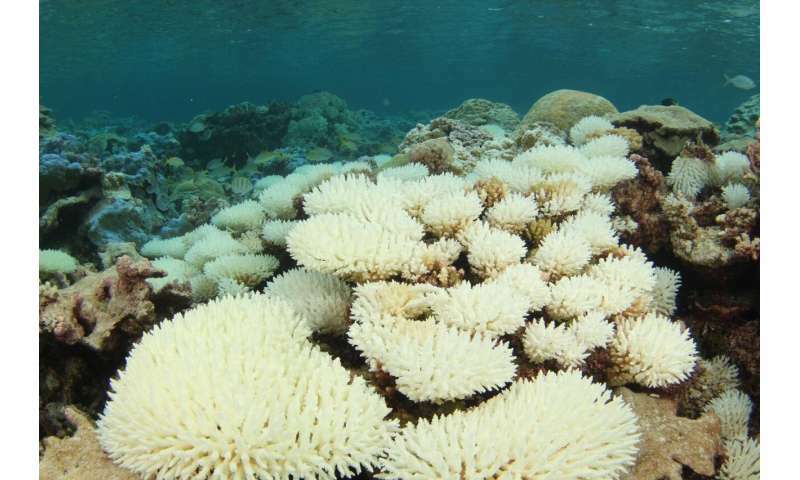 Researchers at Scripps Institution of Oceanography and engineers at UC San Diego have used new imaging software to detect dramatic recovery after a bleaching event on the reefs surrounding remote Palmyra Atoll in the tropical Pacific. The research was published April 5 in Coral Reefs. In 2015, Palmyra experienced its warmest water in recorded history, prompting a widespread bleaching event that affected over 90 percent of the corals surrounding the island. Researchers found that despite the widespread bleaching, most of the corals recovered, with less than 10 percent dying. The conclusions are based on comprehensive monitoring of the reefs and is providing for more precise observations of how reefs are changing over time. The researchers used a long-term data set of thousands of pictures of the same reef area collected over eight years. These images were stitched together using custom software to create 3-D photo mosaics of the ecosystem—a virtual representation of the corals. The technology was developed by the 100 Island Challenge team, a collaborative group of marine ecologists and engineers using the latest technology to monitor coral reefs around the world. "This imaging provides a way of getting back into the environment in a virtual world," said Mike Fox, lead author and postdoc at Woods Hole Oceanographic Institution, who completed the research as a Ph.D. student at Scripps. "It allows us to bring the reef back into the lab." The researchers combined this imaging technology with a new custom visualization software, VisCore, that allows users to re-examine the thousands of photographs that comprise the mosaics. VisCore took more than 15,000 images for every 10 square-meter area of coral reef and then processed the data to turn the images into a 3-D map that users can dive into in virtual reality. The 100 Island Challenge literally unlocked another dimension to Viscore by bringing a highly interdisciplinary research team together, to create the data, algorithms and tools that are now allowing scientists to virtually explore reefs in the lab; to time-travel virtually from year to year; to track the growth and decline of individual colonies; and to study spatial and temporal relationships across the reef. The project was made possible by bringing together researchers from Scripps and the Jacobs School of Engineering at UC San Diego with a deep commitment to the project, said Falko Kuester, a professor of computer science and structural engineering at UC San Diego. "We want to give coral reefs a voice, to tell their stories and engage stakeholders to safeguard them," he said. Hundreds of videos the researchers generated are available on YouTube for public viewing. "The program gave us the unique opportunity to virtually re-visit each of our dives and to examine the reef with a new focus," said Fox. "When we 'dove' back into the images, we realized that the bleaching was even worse than we remembered when we were actually diving on the reef collecting the data." Along with documenting the bleaching, the researchers were able to closely monitor coral recovery. 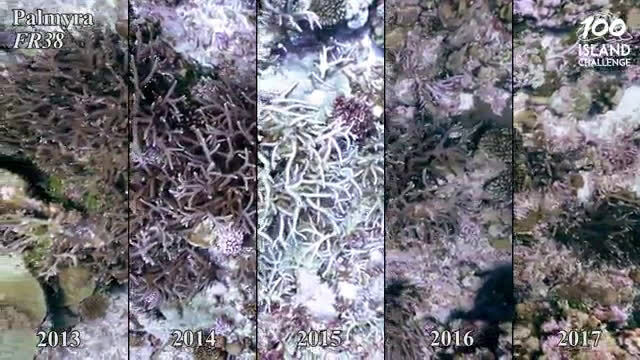 Looking at photomosaics of the reef after the bleaching event, Fox and team documented growth in an important reef-building species, crustose coralline algae. This alga helps hold reefs together and can encourage the settlement of juvenile corals. In areas where coral did die and was covered with reef-smothering algae, researchers saw that in about a year this algae was replaced by the pink crustose coralline. This is partly due to the health of the larger ecosystem, as Palmyra has robust populations of herbivorous fish that can control destructive algae growth. Tracking these recovery processes at specific coral colonies over time gives researchers a deeper understanding of how individual corals—and the larger reef they are a part of—are coping with environmental stresses in the era of human-influenced climate change. Traditionally, changes in coral reefs were measured with transect sampling, in which divers record observations along one specific line across the reef. "It's like trying to measure national population growth by going to one random U.S. city and asking people if they had a child," said Stuart Sandin, a Scripps researcher who co-authored the paper and is co-founder of the 100 Island Challenge. "You're not going to show the larger picture." With the reef mosaics and the pinpoint accuracy of VisCore, coral scientists can look at demographic cues in a vast area. The colony-specific nature of the data gives more precision, and like tracking population growth in a country, can show regional and national trends. "Using a combination of novel technology and more traditional approaches, our team was able to show that the reefs of Palmyra did not suffer the same fate as many other reefs during the recent global bleaching event," said Jen Smith, a Scripps researcher and senior author on the paper, and co-founder of the 100 Island Challenge. "Despite extreme heating, corals were able to recover without experiencing widespread mortality. These findings certainly provide an important counterpoint to the general decline in reef health being reported globally."